My favourite season is here, Fall! Which means a wardrobe update and time to fall head over heels in love with the new must haves. 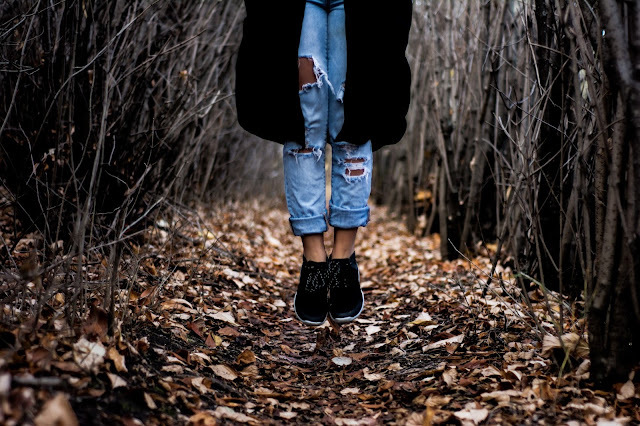 This season brings an array of wardrobe updates, pumpkin lattes (until crimbo comes, then I'm ditching in favour of egg nog lattes) and loads of cosy knits, metals, easy wear of dungarees and studded boots to see you through the fallen brown and burnt orange leaves that come with fall shades. 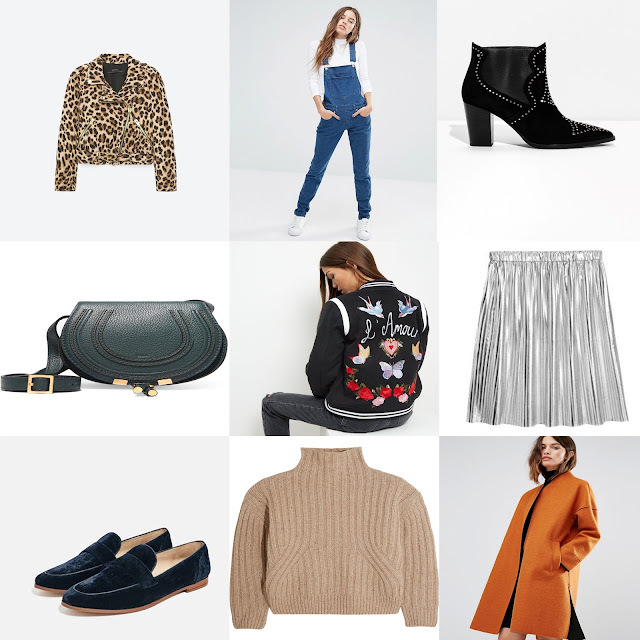 This is my second wish list, you may remember my last ASOS wishlist, which you all seemed to love, so thought I share my Fall Wishlist with you guys. I am currently in love with these, blue velvet loafers from Zara, everyone has been going for the loafer mules, but now that fall is upon us, I need my tootsies to be completely covered as I don't particularly fancy walking around with wet feet. Velvet is a big trend for AW16 and blue is one of my fave colours, but not matter if your opting for the dark romantic shades of blue or an electrifying yellow velvet is the way to go. Still on the tootsies, studded boots are a must have, if you are looking for a classic yet statement boot look no further that to & Other Stories for these beauties. A new season calls for new outerwear, be it a leopard print, embroidered or a block colour, no outfit is complete with out a new jacket, this Leopard print jacket is from Zara is bang on, can transform any outfit into something magnificient, be it the school run, lazy sunday or drinks with the girls. Embroidery no matter what it is on, is a bang and everywhere right now and I am loving this New Look bomber, I am total idiot as soon as it came liven their website I should of purchased, but had to go and pick up Leanora from nursery, time I got home I forgot and only remembered the next day to find that it had been sold out (unhappy face). But alas their is always a new kid on the block and this time it comes in the form of this beaut of a coat from Warehouse. Still not a major colour person, I simply feel straight in love with coat, the colour reminds me of bonfire night (2 days before my birthday FYI lol) and the fall burning wood/fireplace smell (I know crazy right, but i'm all about the smell kinda gal). Now who doesn't want something that is easy and comfy to wear, be it for a pub lunch, running errands or just a normal kinda day and want to feel snug as bug in rug (not that i'm a bug) Dungarees are an all time fave and now a regular staple ever since I did my Mother & Daughter Day post, they are just so easy to wear and they even look great distressed (i.e covered in mud, food, milk, baby spew, coffee etc) and team these Dr Denim dungarees up with a chunky knit, such as this ribbed jumper from Totême and Bingo thats what I'll be in this fall. Now if I'm off out I want to wear something that stands out and Metallics is the way forward, but take note it is not great in the washing machine as I had to find out, I have purchased this metallic skirt from H&M already and had to return it as the colour ran out, so best to hand wash.
Now each season comes with a must have bag and for me, it is this bottle green bag from Chloe that I am currently coverting. A great essential to keep all my essentials in, which you may remember from my Mumma's Handbag Essentials post. What are you coveting this Fall? Do you think I should do a kids Fall Wishlist? Don't forget you can keep up with us on Bloglovin & Instagram.